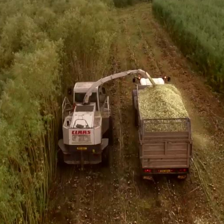 Sunny Jim has been an established brand in Northern Ireland for 50 years and today it is the biggest value firelighter brand in the north. 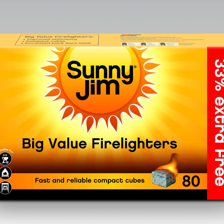 The Sunny Jim ‘Big Value’ range offers the consumer a variety of fast and reliable firelighting solutions at appealing price points. Sunny Jim products make firelighting and barbecuing convenient and enjoyable. Sunny Jim was launched in the UK in 1968, giving 50 years of heritage. Sunny Jim is now a household name in both indoor and outdoor fire products. 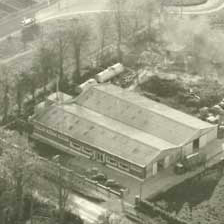 Sunny Jim firelighters are made in our factory in Castlebellingham, Ireland, which was set up in 1956. Sunny Jim firelighters come in a variety of shapes and sizes to suit all needs and occasions. 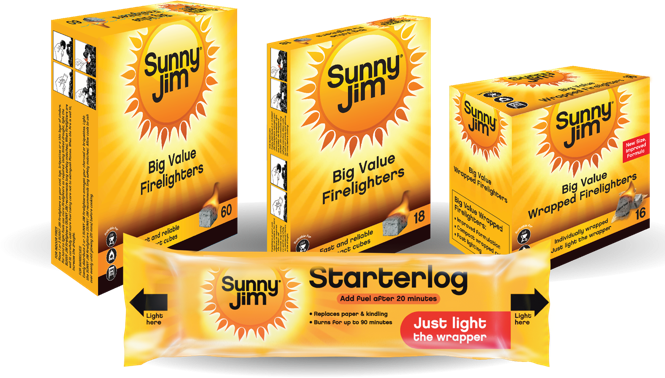 Sunny Jim’s firelighter range includes block and wrapped firelighters. All of our firelighters are powerful, long lasting and fast lighting. 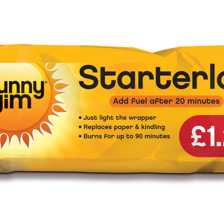 Sunny Jim’s starterlog is a convenient way to easily light fires and to provide up to 90 minutes of fuel. 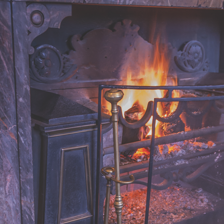 Designed to be the quickest lighting log in the market, the starterlog replaces the need for paper and kindling.